Capricci showing alternative elevations for a symmetrical domed building. The upper elevation has an aedicular doorway with pediment above, roof belvedere and pedimented porticoes to either side. The lower elevation is composed of a three-bay portico with thermal windows above and a small dome on an attic storey with sculpture. 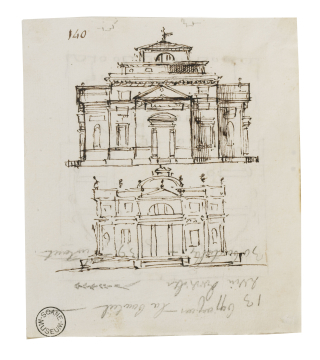 You are here: CollectionsOnline / Capricci showing alternative elevations for a symmetrical domed building. The upper elevation has an aedicular doorway with pediment above, roof belvedere and pedimented porticoes to either side. The lower elevation is composed of a three-bay portico with thermal windows above and a small dome on an attic storey with sculpture. Capriccio in pen showing the plan of a rectangular building with circular interior of apses and columns, leading to a projecting portico and rear campanile. The inscription probably has to do with the domestic arrangements of Robert Adam's house while in Rome, Casa Guarnieri. The upper elevation of this small villa is of the Palladian Villa Rotunda type, and both elevations can be compared with similar compositions in Adam vol.55/52 and 53 , and that on the verso of 55/144.